This is my own recipe for Cornbread. 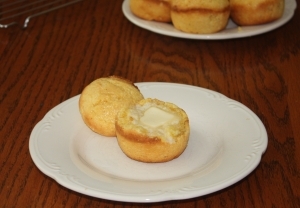 It makes a sweet cornbread, which may not be traditional, but it goes well with barbeque and more importantly, my kids like it! This recipe makes about 18 muffins, or a 9 inch cake pan or skillet of cornbread. Whisk together the cornmeal and cake mix in a mixing bowl. In a blender or food processor, pulse until blended, the eggs, sour cream, and ½ cup of the thawed corn. Fold together the liquid ingredients and the dry ingredients. Add the rest of the corn, and the melted butter, stir well. Grease your muffin cups or pan, or spray with cooking spray. Bake in 350ºF oven for 25 minutes, until a cake tester (toothpick) comes out clean. It will take longer if you are using a cake pan or skillet instead of a muffin pan. Allow cornbread to cool in the pan for five minutes then carefully remove from the pan to finish cooling on a wire rack.